Each white and black key is a separate SPRITE. We began by drawing the white Middle C SPRITE which has two costumes. The first costume is white and the 2nd is a different colour (you choose) that flashes up when the SPRITE is CLICKED. 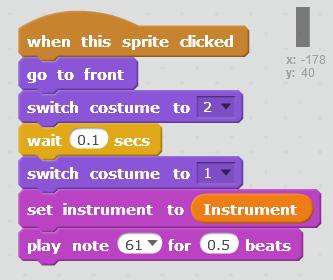 This helps us to see which sprite is responding to the click. Note the SET INSTRUMENT block! when you initially use this block, you must change the instrument number using the drop down arrow. If you use this method for more than one SPRITE, it gets difficult to change the instrument manually since you must do it for every sprite every time. 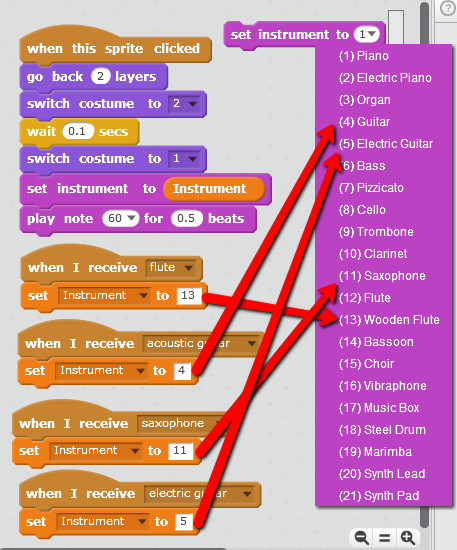 So we created a VARIABLE called INSTRUMENT. When we create this variable, a block appears on our STAGE. Right click this variable block on the STAGE and choose SLIDER from the menu. This will create a slider look to the variable block so you can slide it up and down to change the value (see image 1). So now all you have to do is drag and drop the variable INSTRUMENT into the SET INSTRUMENT TO (_) BLOCK. (See image 2, above). 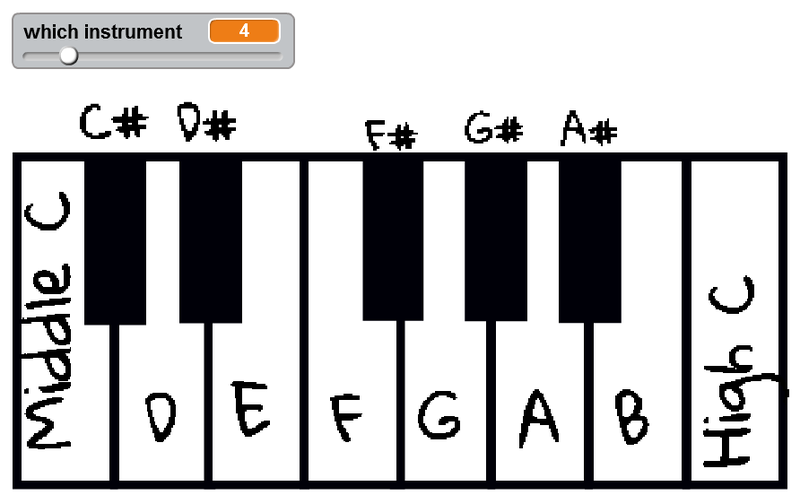 In the PLAY NOTE block, be sure to select the proper note for the key that you want to play – Middle C note for the Middle C key and the D note for the D key and so on. Be sure to label all your Key SPRITES!!! 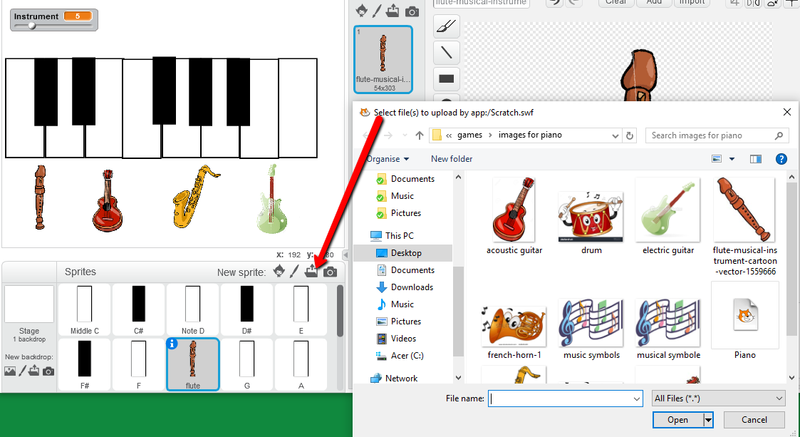 Once you have the MIDDLE C KEY coded, you can copy it to a new SPRITE and name it NOTE D. Change the PLAY NOTE BLOCK FOR THIS KEY. 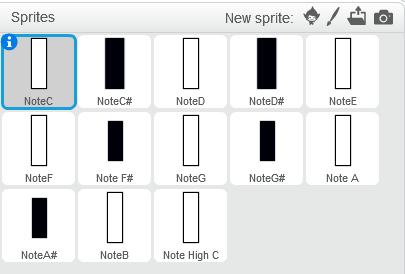 You must create a new SPRITE for the black keys which is smaller and, of course, black instead of white, but it has the same scripting as the white keys. You will need 8 white key SPRITES and 5 black key SPRITES. The coding is essentially the same for all of them, be sure to change the note in the PLAY NOTE block and make sure the coloured costume is switched to first. To tie this challenge into our previous challenges, I decided to make my piano a little more user friendly. Instead of having the user move a slider back and forth to choose the instrument sound, I want to import a few more sprites that – when clicked- broadcast a message that tells the MIDDLE C key to change the variable INSTRUMENT to a specific value! 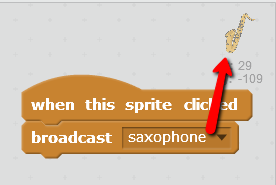 Each instrument SPRITE you import broadcasts a different message to the MIDDLE C sprite. 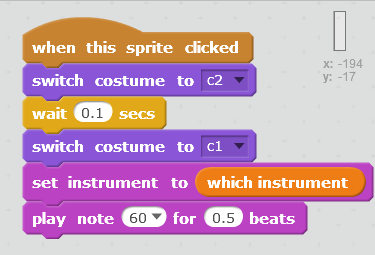 The MIDDLE C sprite responds by changing the VARIABLE INSTRUMENT to the appropriate number. Check your coding often to be sure you haven’t scrambled the instruments! As we progress in programming, neatness and good organizational skills is a MUST! 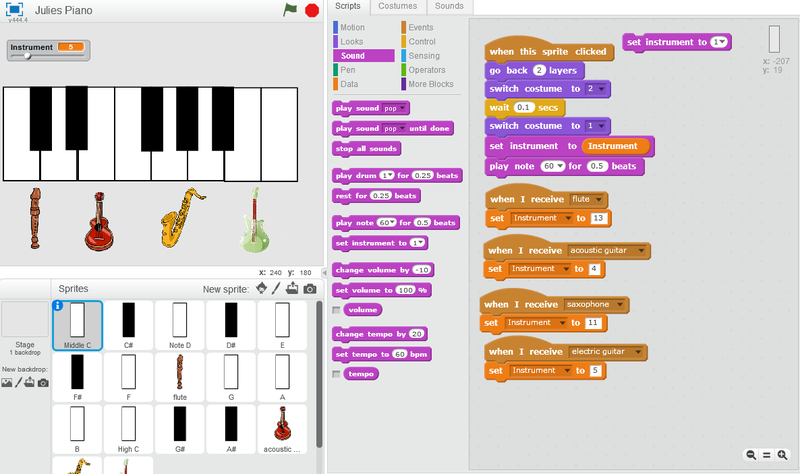 In the end, my game looked like this and is on the SCRATCH.MIT.EDU website! My coder name is cdathenry1516. We will be away for the next two weekends due to the hall being unavailable and the May bank holiday weekend. We are back on the 7th of May when we start writing our own programs in the pursuit of a Coder Dojo Belt for Beginners scratch!! !